My mama has always said there’s nothing more interesting than an interested human. And she’s so right! It is this curiosity that human progress feeds on; but for too long, girls were not encouraged to follow their curiosity. With educational disparities and discrimination in the classroom and workplaces, the world that we occupy as women comes with the tough reality: we must persevere. Spaces only get more complicated to maneuver in when we include our various intersecting identities: ethnicity, race, sexual orientation, gender identity, religion, citizenship status, abilities, etc. But what the women who have charted maps of ingenuity, intention, and success have proved is that when women feed their potential, they in turn feed human potential. We are in the midst of a cultural revolution, and women of all walks of life are leading the charge in the fight for equity! Watching this moment in history inspires me and so many of my peers to push past perceived boundaries and create new possibilities. The brilliant humans in this book represent women who became the change they wanted to see, feel, and experience; and in doing the work, these fierce young women have created space for others to follow suit. I was fortunate enough to visit the Obama White House four times. In fact, President Obama once joked that I should get my own office in the White House. (I quickly closed my eyes to manifest this!) While any opportunity to be in the same room as the Obamas was a gift to me, one of the moments emblazoned on my spirit happened when I cohosted the White House Science Fair, alongside entrepreneur and educational philanthropist Karlie Kloss, under the guidance of scientist Dr. Knatokie Ford. We interviewed brilliant young scientists from around the United States about the scientific innovations and breakthroughs they were creating. Kids of all ages were turning their passions and skills into making education more accessible, creating diagnostic tests for the Ebola virus, inventing alternative power sources, and so much more! The biggest impact, however, was being surrounded by women of different generations—watching the young female scientists exhibiting their findings and Senior Advisor Valerie Jarrett and Dr. Jo Handlesman excitedly participating. The unwavering support from President Obama alongside the brilliant women of the White House, celebrating what is traditionally a male-dominated field, reinforced in me and so many others the deep and continued need for female voices in all places. The inspiring female staffers in this book did not just “happen” to land a job in the Obama White House. They worked for it, knowing that other young women were watching and preparing to step into the spaces they created for us through their experiences—good and bad. 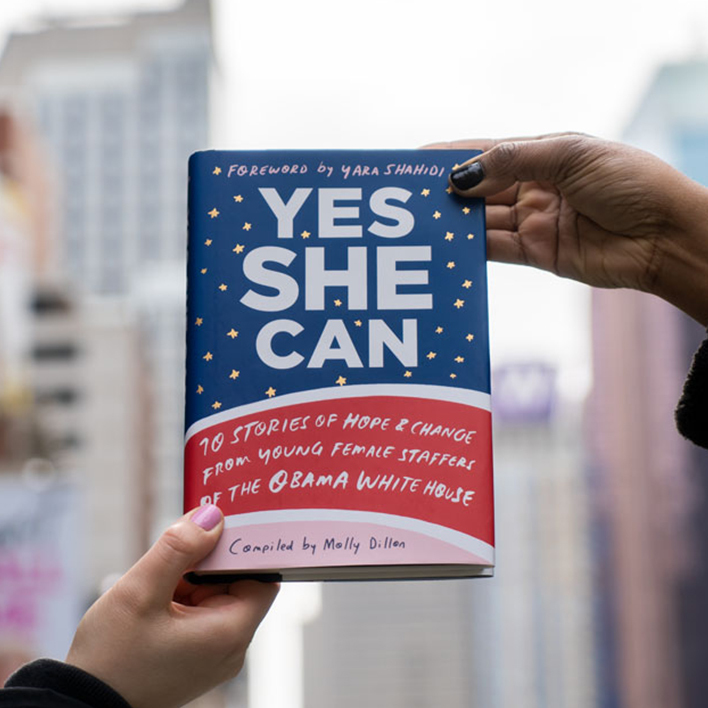 Yes She Can is a gift; it’s filled with ten women’s inspiring stories about entering public service under the Obama Administration and how they didn’t just survive but thrived in these spaces! These intelligent humans know the importance of their voices and values and became the representation that we are so lacking. Each had her own path to the White House and, once there, made her mark on the world—all while clearing a path and expanding the vision of a more inclusive America. These women, in part, inspired me to create Eighteen x 18, an initiative to increase youth voter education and turnout. They demonstrated for me and my peers that politics can no longer happen without us—we must share a common love for our global community. Their stories serve as a reminder to young people that we are not alone in this fight, that there are women who have taken it upon themselves to trudge through the sometimes treacherous terrain of politics and public service in order to open the doors and let us all in. Their presence has undoubtedly carved the way for us Gen Zers, and I am so grateful that they have decided to share their experiences. May our voices continue to carry the power of generations of women from the past, present, and future!